Dear Anand, – It was a pleasure to provide initial comments on our tour by phone and I am happy to expand upon them in writing. I found the Three Himalayan Kingdom tour to be a truly fascinating experience. Visiting Tibet, Nepal, and Bhutan on the same trip highlighted the cultural and religious similarities as well as the distinct differences between these regional neighbors. For me the real highlight of the trip was Bhutan and I quickly realized after we arrived from Nepal that the Bhutan portion of the trip was going to be too short for me (though I know that some in our group found it to be the right of time for them). It was a bit of a trade-off for adding Tibet and Nepal to the trip; in retrospect, I would have added some days to the Bhutan portion so that I could see more of the country. In such an enchanting country, where every view could be a postcard and the people are so kind and generous, it is difficult to single out particular experiences as highlights of the trip. There are the obvious ones, such as the Thimpu Tsechu and the hike to Taktsang Monastery, but the moments that stand out for me are the interactions with local people, like the lovely housekeeping girls at the Druk Hotel who made sure that I had tied my kira correctly, the funny conversations with the owner of the guesthouse in Punakha (which ended with me in the kitchen teaching him how to make guacamole with his outstanding avocados), the visit to the primary school near Paro where we distributed some supplies to the students, and our farewell dinner at the home of a welcoming family. 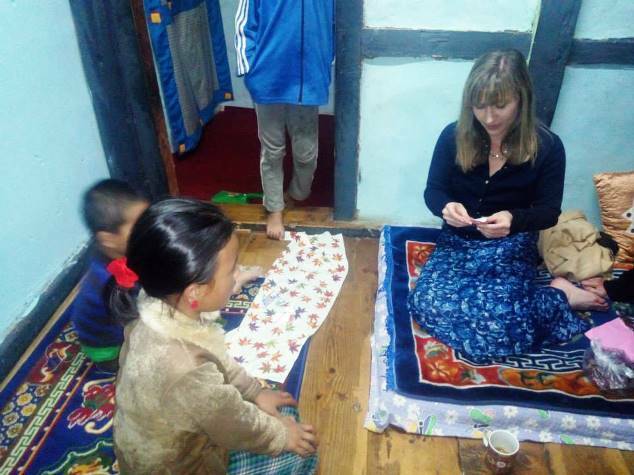 Not only was the farmhouse meal the best that we had in Bhutan, but upon learning of my fondness for Bhutanese chilies and particularly for ema datshi, they generously gave me a big bag of dried chilies as well as seeds so I can try to grow them at home. And it was great fun reviving my origami skills and playing with the charming children of the house after dinner. Of course we could not have had these experiences or appreciated the beautiful dzongs, festivals, and temples without an excellent guide. Kuenzang was exceedingly patient, accommodating, and informative. His knowledge of the religious and cultural traditions was essential for our understanding of the places and people that we visited. Most importantly, I believe we all enjoyed spending time with him. He has an engaging personality that is a perfect fit for the guide profession. I also cannot praise enough our wonderful driver. Not only did he expertly navigate the tricky roads with seeming ease, particularly the construction on the Thimpu-Punakha route, but he kept the cleanest bus around and was always there with a helping hand and a smile. Finally, I cannot fail to thank Jambay, Ugen, and all of the Windhorse staff for their efforts to organize the trip itself. Their excellent planning, timely updates, and helpful pre-trip information ensured that we were well prepared for the trip and that tour itself was problem-free.